An exhibit of Japanese Bamboo Art entitled "Hayakawa Lineage" will be on display at TAI Gallery from July 29 through August 10, 2011. There will be an Opening reception July 29 from 5 to 7 pm. There is an almost forgotten term in Japan: “Ransho”. It means “the master of all masters.” Hayakawa Shokosai I was given that recognition. The creative Japanese bamboo art tradition of innovation and excellence begun by him expanded for 150 years and continues still. Today the fifth generation in the artistic lineage, Hayakawa Shokosai V, is a National Living Treasure of Japan. TAI Gallery is proud to present an amazing selection of artworks by four of the five generations. 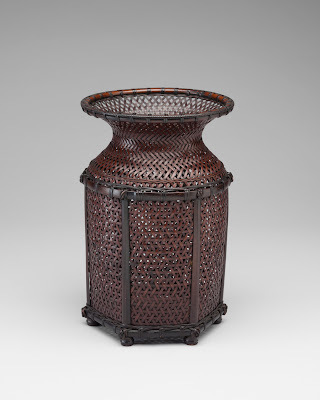 Shokosai V and his ancestors were all visionaries in the world of Japanese bamboo art. Their family is a source of inspiration for bamboo artists across Japan. The classically restrained pieces they formed show sensitivity and presence combined with boundless imagination. 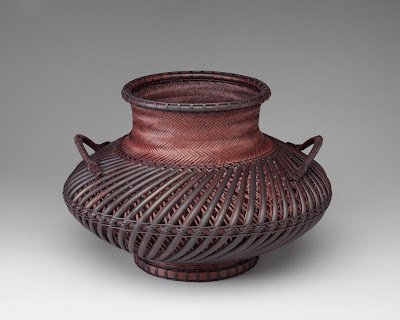 The Hayakawa family baskets have careful satin finishes and distinctive contrast created by layering various plaiting techniques over one another. Their imaginative approach to baskets as art show ingenious and inspired thinking only master artists have.